You can tell by the color that these lack a deep chocolate flavor. I bought The Clueless Gourmet cookbook several years ago and, soon after purchasing it, made its brownies more a number of times. And then, for whatever reason, never made them again. When I want a brownie now, I just doctor a very dark chocolate brownie mix by adding a half-bag of dark chocolate morsels and a half-cup to a cup of chopped nuts (walnuts or pecans) and bake to the chewy brownie directions (not cake-like) brownie directions. They’re effortless and delicious. But I’m trying to perfect a new frosted brownie recipe and I don’t want to use a box mix. As a result, fond memories turned me back to the Clueless Gourmet. No chocolate chip or nut additions here — I thought they’d distract from the flavors in the frosting. 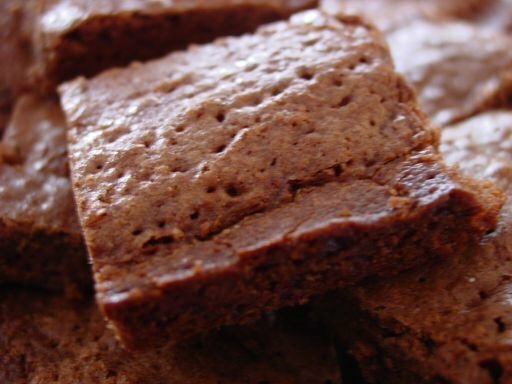 As it turns out, it doesn’t matter: I’m not using this brownie recipe for my frosted brownie plans. It’s not they’re it’s not tasty — they are — but it doesn’t have the deep chocolate flavor I’m looking for. Is it because I used the Scharffen Berger again? Maybe. When I eat a brownie, I want it to be sinful. These don’t do that for me. The chocolate notes here are less of a deep, rich chocolate and more of a light cocoa. Again, this is a good recipe. It does have a nice butter flavor not normally identifiable in brownies. Should you make these? Sure, especially if you don’t have a lot of experience in the kitchen. There’s a lot to be said for uncomplicated recipes. They’d be overwhelmed, however, by the brownie frosting I plan to make, and that’s a dealbreaker. Back to the drawing board. Preheat oven to 350-degrees. Line an 8-inch square pan, or 9-inch cake pan or pie plate, with parchment. Place chocolate and butter in a bowl and microwave for about a minute; stir. Continue microwaving at 30 second intervals at 50-percent power, stirring after every 30 seconds until everything is melted. In the bowl of a stand mixer, beat the eggs and sugar for about a minute. Add the salt, vanilla and melted chocolate to the egg and sugar mixture. Stir until well blended. Fold in flour; when just combined, pour batter into pan. Bake for 20 to 30 minutes until edges and top appear cooked and a cake tester inserted in the center comes out almost dry. Cool completely on a cooling rack.